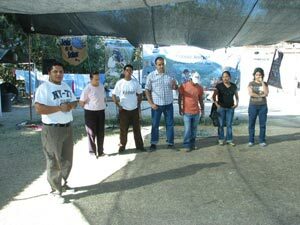 By Beth, one of the participants in the Culiacan outreach in Mexico in 2011. What a great experience to go to Mexico for 2 weeks and help pass out free CDs and booklets of John and Romans in Spanish. The Project Culican goes the whole month of February but I was only there for part of it. Wonderful Christians who are very dedicated and loving work this project, many had done so for several years. This is the 21st year of the project and it is a blessing to those who give and to those who receive. The first week of February there were 2 nights of freezing weather that damaged 80% of the crops. Some of the migrant workers who had come for 7-12 weeks of work got only 7-12 days of work--not nearly enough salary to sustain their families . Even the farms that had brought the workers on buses were struggling to find the money for the buses to return them. Even so, we reached several camps just before the workers were leaving to go home and were able to hand out CDs and Bible excerpts before they got on the bus. Sometimes this was all we could do. 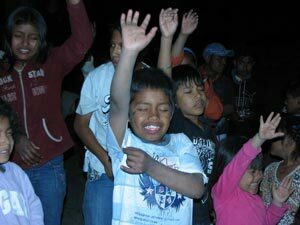 At other camps we had puppet shows for the children, followed by movies about Jesus which would start about dark. While this was being set up and going, workers would go out by 2s and 3s to diagnose the indigenous language speakers and make copies of CDs for them in their heart language. Project Culican has 250 indigenous languages ready to distribute [and is still discovering a few that have not been translated yet]. We gave out over 6800 CDs in about 110 different languages and over 6000 in Spanish. There were around 3800 people so far who repented and claimed Christ as their Savior. Most exciting moment of my trip was when we pulled into a camp where there was a guard with a machine gun on his shoulder. He told Manny that we couldn't come in, which he reported to our people in the van. Dave wasn't taking 'no' for an answer, so Dave and Manny got out again and the 'comandante' came up with his obvious shoulder holster. Dave and Manny explained that we were allowed in last year, that this project has been going of every February for 21 years, etc. Things got pretty heated and the comandante pulled out his 357 and shouted, 'Don't you understand Spanish!' The guys got in and we found another camp. Most heart-rending is to see the children who come along with their parents. They are supposed to go to school but some work alongside their parents in the fields. I saw some whose families lived in shacks made of wooden pallets covered with cardboard. Worse yet is those who are exploited in the vices of adults in the camps. The farm workers in the camps live in metal buildings with cement floors called 'galeras' which consist of 20-30 rooms each. These have gaps between the walls and roof and the walls that separate rooms do not go to the ceiling. Each room is about 10' x 12' and a whole family or group of single men lives in the room. Showers and toilets are in one area for several galeras. The toilets are a recessed 6" hole in the cement floor often with shower above--multi-use! And GROSS! In many camps the people cook on campfires outside their rooms. Most have to go for water to a common faucet for the camp [like the village well]. These people are very needy in many ways. They have few material possessions and often a family packs their thi ngs in a few feed sacks. But their spiritual needs are even greater. Many have never heard of Jesus; the whole Bible story is new to them. They have lots of intelligent questions after seeing the movie. They request prayer. 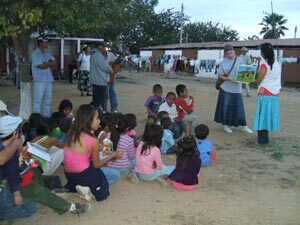 They are grateful for the CDs we hand out, as many do not read any language; they are grateful that God cares about them enough to send a few clumsy missionaries to show them a movie and share the good news with them. 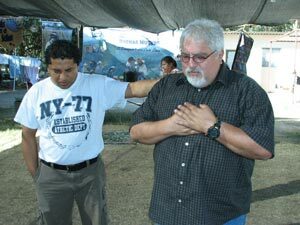 The missionaries for Project Culiacan are often almost as needy as the people we minister to. 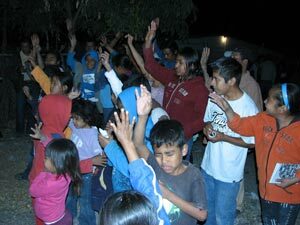 Some have their trip financed by their financially poor churches..Some speak one of the indigenous languages as well as Spanish. Some speak only English but want to help. They come from different backgrounds and states, but all want to help. They are united by the love of God and willingness to serve. While I was there, between 35-50 people worked on the project. One day a local church sent 25 people to help and that was a blessing. As the month progresses new people come and some people leave but the total number seems to go down each week. These are true Christian brothers and sisters who encourage each other and help each other in this imporant work. They are divided into teams to go to the camps so sometimes up to 5 camps would be visited at the same time, if there were enough workers. For large camps, 2 teams would go together. All in all, it was a great blessing for me to be able to go Culiacan and help. Thank you for your prayers and support in making it possible. Now that I'm back I'll do laundry and get rested and be able to answer any questions you might have. Hope to see you soon.